When I pick up my ticket for the Hikari Shinkansen from Kyoto to Hiroshima the agent explains that I must change trains at Shin-Osaka. From there to Hiroshima I am in the Number 4 Silent Car. No conversation is permitted and no announcements will be made. Stops are cued in four languages from a scrolling marquee at the front of the car. Recently touch screens have been added. 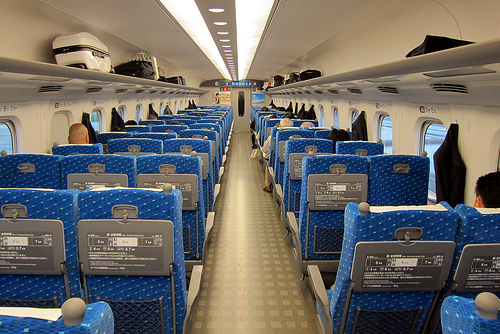 Interior view of a Shinkansen. Photo credit Wally Gobetz. Used with permission under Creative Commons License. Websites describe the Number 4 Silent Car as more relaxing than other cars. I’m not sure about that. Generally speaking, Shinkansen passengers are a well-heeled and polite lot. More often than not, they sleep. With their phones on manner mode, they take calls (if they must) in the designated spaces between the cars, or they text. Any announcements on the Shinkansen are dulcet and hypnotic, hardly an intrusion considering the infrequent stops. I have other theories. As I settle into my seat I notice that Number 4 Silent Car is packed with non-Japanese and few nationals. Four is a very unlucky number in Japan; it is a homonym of the word death. People avoid it. I wonder whether there isn’t more to the Silent Car designation than heightened relaxation. It would make good sense to fill an otherwise empty car with non-Japanese unaware of the superstition. Today’s crowd is comprised of conference-bound academics travelling as a group—their dowdy intelligence immediately recognizable without any speech. The others are businessmen and a few backpackers. I also wonder whether we haven’t been unwittingly enrolled in ancillary gaijin (foreigner) training. Now that you are on our shores, here you go. We’ll have none of your animated chatter, quick connections and easy laughter as you go. This is public space. These are the rules: Sit down in your row and stay quiet. This is how it is done in Japan. This entry was posted in Japan, Travel & Culture and tagged Shinkansen, Silent Car. Bookmark the permalink.